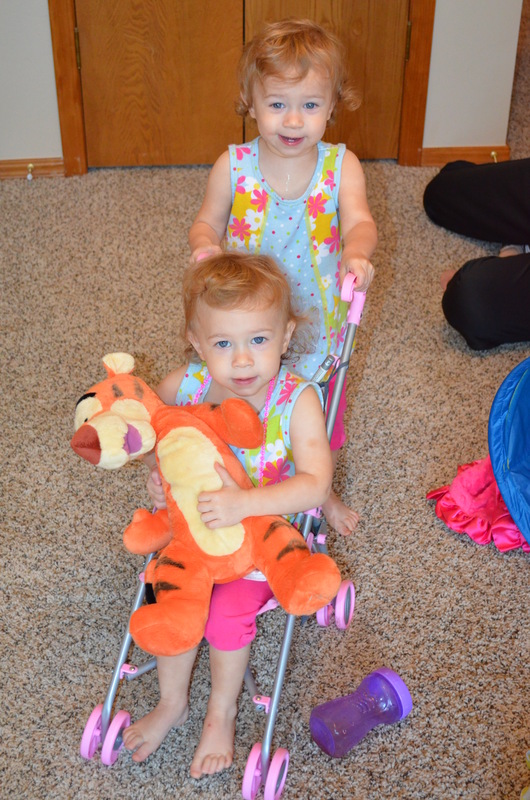 My little babies are becoming little girls…. I am obviously not doing a very good job keeping up with this blog lately. We have had a crazy month with selling the house, moving and the girls literally having a cold and cough for three weeks. We have battled a lot of sleepless nights, which only confirms Bryan and I’s feelings about NOT having anymore babies 🙂 This past month has been emotional, physically demanding and time to really reflect on our future. 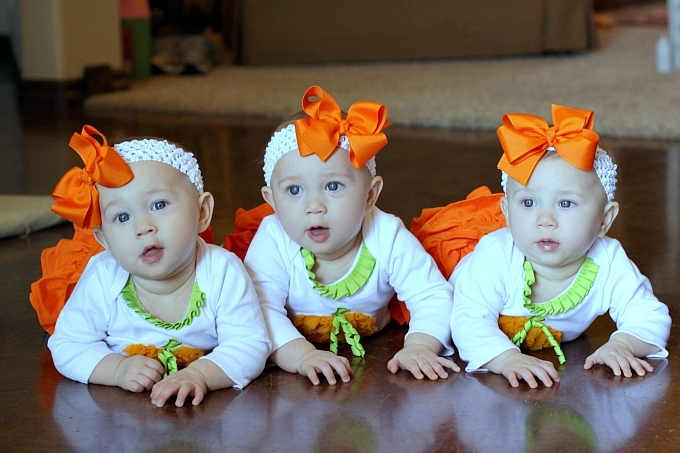 Through it all, we are incredibly blessed by these three amazing (Tear…) little girls. A year ago, this is what these precious babies looked like…They were 8 months old and just the most darling little pumpkins anyone has seen. These days, we celebrate them turning into little girls. We are chatting up a storm. Camdyn still talks the most. We are still working on “sharing” and not being so mean to each other when we don’t get our way. We are also developing our own likes and interests, which is so fun to watch! Here is a pic of Miss Emily. 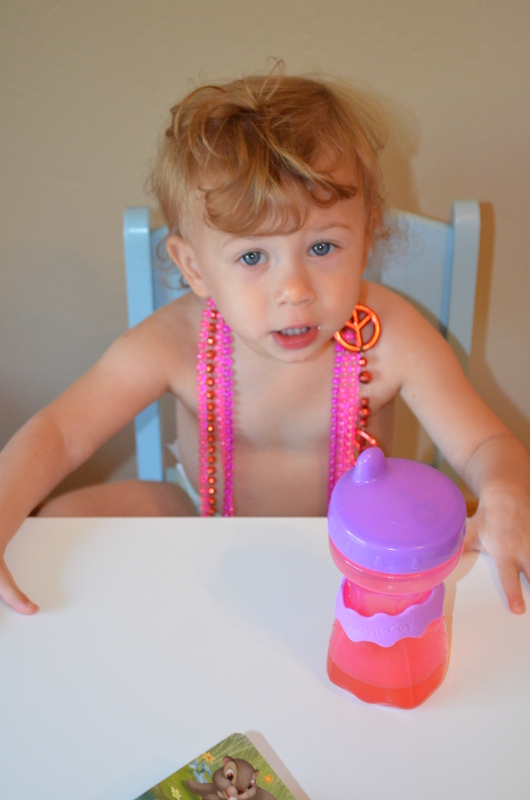 She has an obsession with necklaces lately. The girls would always point to my earrings or Mimi’s jewelry and we would say “Pretty.” Now, they really understand jewelry. Look at this little girl. She wears at least four at a time. Five or six if she can round them up! Emmie is still my most content child. Now, that doesn’t mean she doesn’t have her moments. She is stealing her time with Mama and Dada in the middle of the night lately in our bed! We can’t resist. Sometimes its our only time to have one on one. But, sleep is much-needed in this household so don’t know how much longer we can endure. She is also our most methodical child. 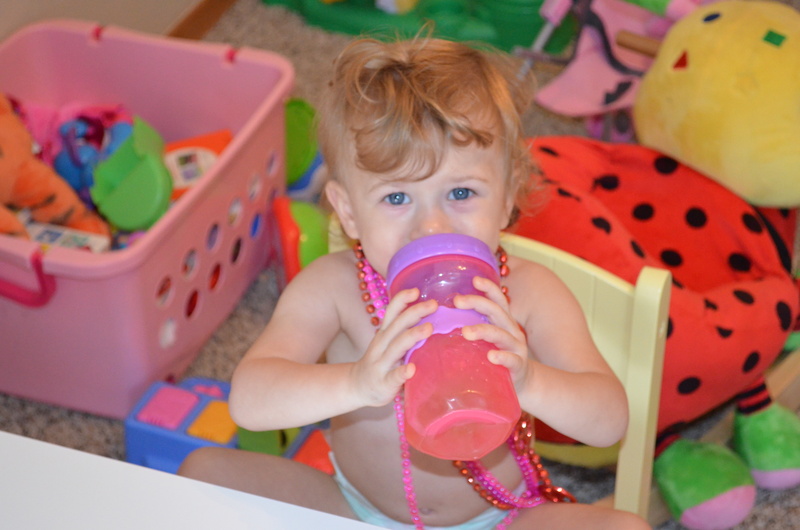 She really loves figuring out how to put things together or she loves the toys that are a little more challenging. She is also the one that will hold her attention longest when watching Sesame Street or any other video on TV. As I said, we are learning more how to share and be buddies. Below is Avery and Camdyn. The baby strollers are a big hit. But, they don’t usually push the right kind of babies in them. Avery is my girl who went from being a baby to a grown up in just months! 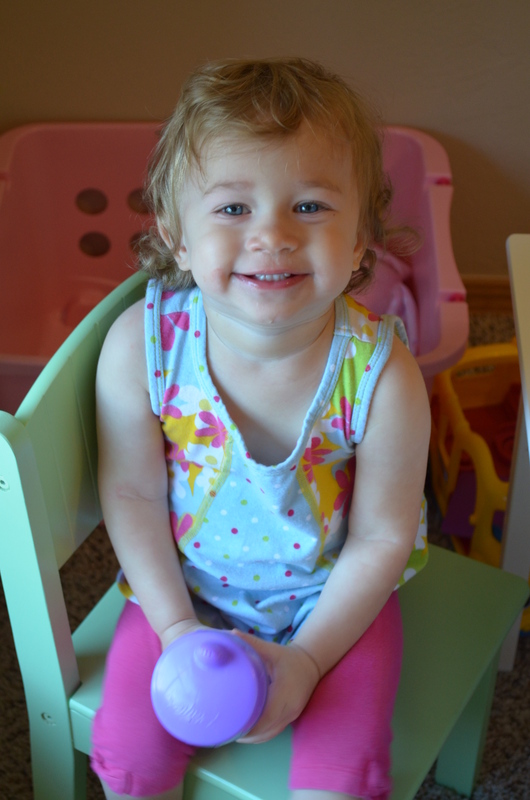 Here she is just cheezing it up for me in her big girl chair. 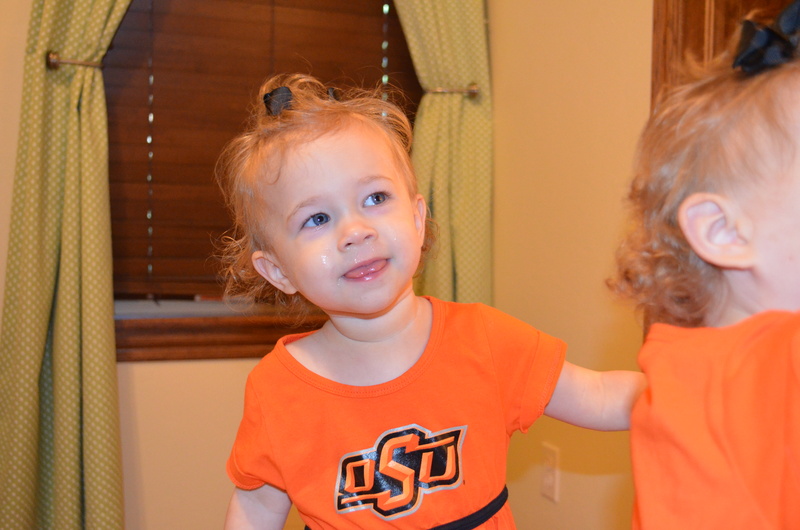 Here is Camdyn in her cute little OSU dress. People tell me she looks the most like me. Bryan and I still can’t figure out this whole identical thing. Her and Em are supposed to be identical, but how does she look like me and Em look like Bryan? Cam is still super sweet and loveable. She is also in a laughing phase. She seems to giggle the most out of all the girls. Love the sound of that. 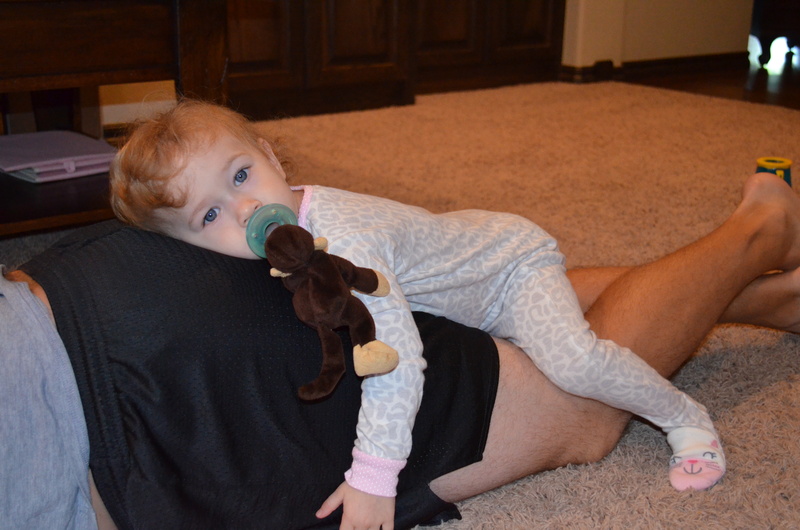 Cam laying on Dada’s back side. Hehe. Months ago, people asked me if things were getting easier…I quickly said yes. I was too quick. The girls are so much fun and changing before our eyes, but with that is also the need for constant activity and attention. We are working on getting them in more activities that really help them release their energy and have fun with other kiddos. 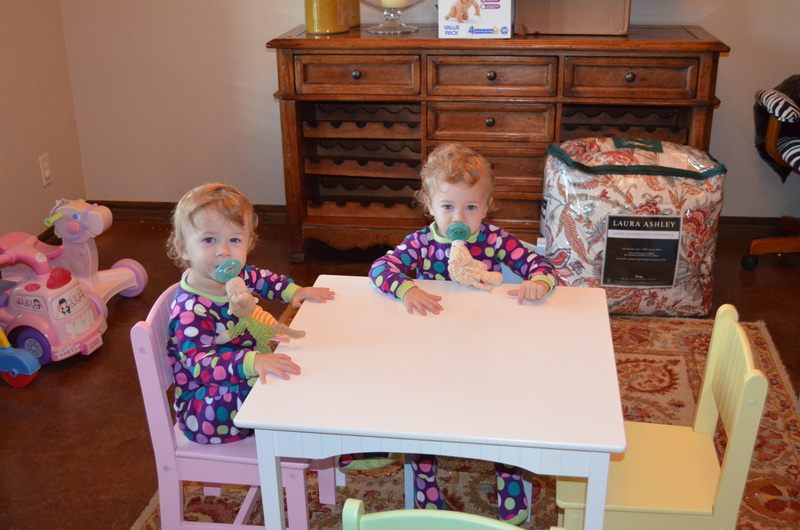 This Mama is doing her best to cope with the ever-changing world of raising multiples. Still working away to visit with other moms with multiples too. I got together with three other moms with triplets. Yes, all triplets! One mom, who is so funny, has a newborn also in addition to her triplet toddlers! I actually met another spontaneous triplet mom too! She has toddler boys about to turn three. And she is a veterinarian. What a super mom! I have not written a blog post in a month! Life has been pretty hairy right now. Biggest change is that we SOLD our house! Yipppeee…Bad news was we got the news two weeks ago and they want us out by September 10, which is this coming Monday. We spent all Labor Day weekend…laboring…and moving what we could to our rental house. The rental is surprisingly in the same neighborhood and my parents are thrilled. It really was a blessing how it all worked out. We sold our house one night and in 24 hours had another place to live. Thank goodness. Now moving with three 18 month olds is another story! And three sickly kiddos. They are battling the cold allergy stuff going around. I am tired of dosing medicine on top of that too! The girls are all of the 18 month old toddlers they are! They are wild, wooly and in to anything they can get their hands on, around, etc. Quite jealous of each other’s time with me and the grandparents, possessive over toys and honestly sort of mean to each other right now. I look at it as a time of marking their territory and see this as the beginning of how it will probably be for the rest of their lives. Hoping they will learn to love each other instead of bite each other or fight over toys. Their 18 month check up went great. They are still growing and progressing awesome. Emily is still the smallest and only in the 3-5% for weight but we love her just the way she is…That is why she is endearingly nicknamed “Emmie Bug” by her Dada. Avery is honestly like a three-year old! 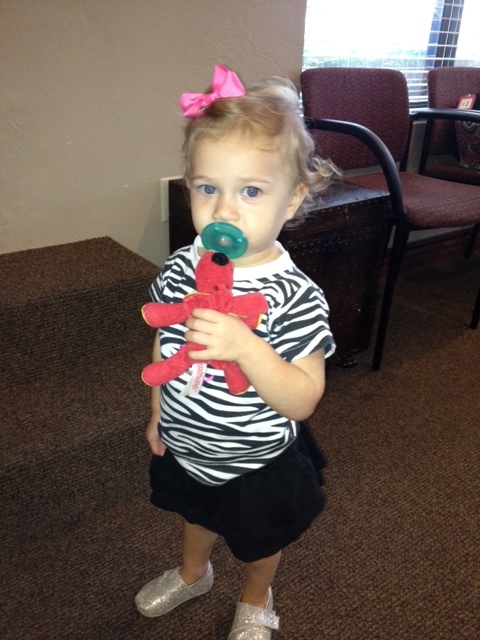 She is in the 90% percentile for height and Camdyn is just in between the two. All rocking and rolling and doing the funniest things right now. 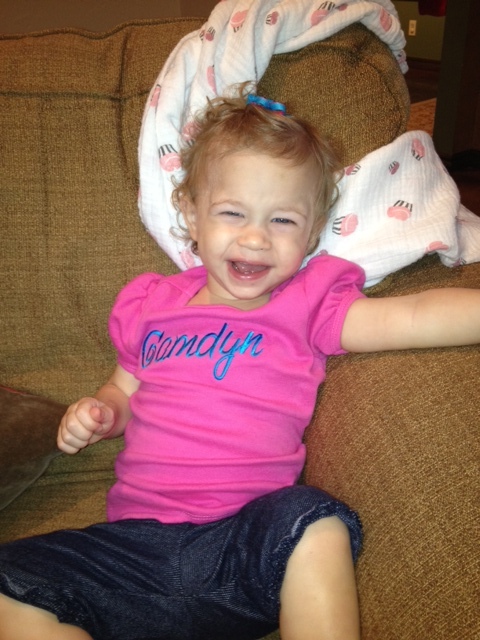 Their vocabulary is increasing and Camdyn especially has been a little chatter box lately. We have battled bed climbers, which has been not funny at all. Emily crawled out and we heard her crying. Fortunately she was not hurt, but she has not done that since. We had to separate their beds a little until we move into our new house and can officially separate them in different rooms if we wish. May be a good time for them each to have some privacy and peace and quiet. 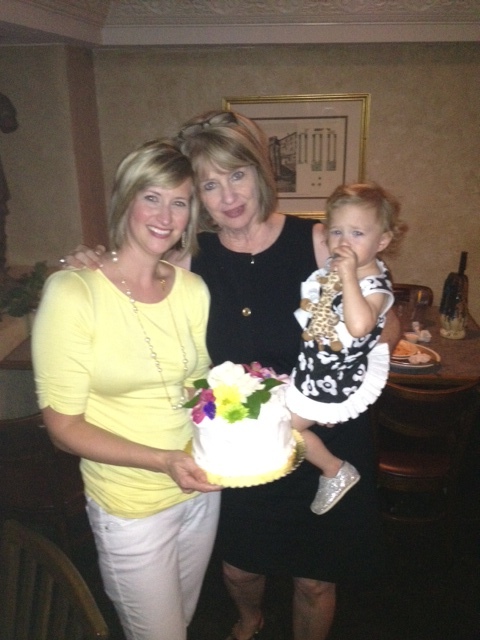 On another note, we celebrated my mom’s (MiMi) 60th birthday. Sorry Mom, I put it out there..We attempted a family dinner at a restaurant and that was not a good idea. The girls just do not want to be contained at the moment. We were those people who the other people stare at in the restaurant. Was not a good feeling but we did our best to make her day and evening special. This pic is of me, Mimi and Avery. 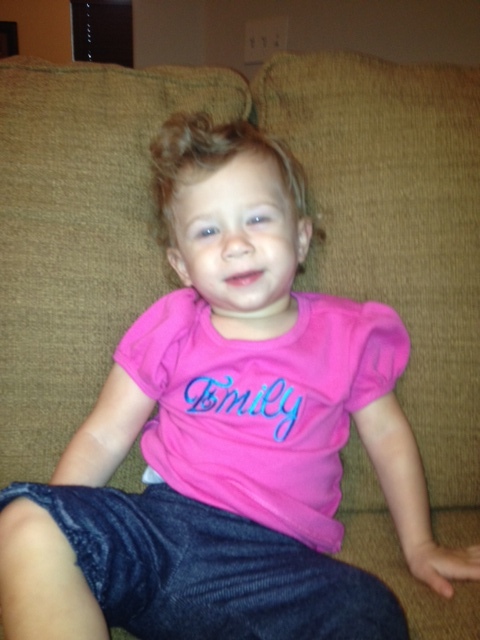 My Emmie Ray – Crazy hair huh? She won’t like me pulled it back! In my downtown, haha, I started a group on Facebook – Mommies of Multiples (MOMs). There are times where I feel moms of multiples can only understand the challenges with more than one child or even children that are the same age…at the same time…I invited 12 people I knew with twins or triplets to the group and it grew to 150 plus members in two weeks! We throw out topics related to raising multiples and it has been a good place to share information and talk to other moms with the same challenges. So, we are packing up and moving on to the next chapter in our family. Our new home will not be ready until close to Christmas. Although the stress associated with this process is unbearable at times, we are staying positive and looking forward to our first official new home as a family of five! My prayers lately have been for strength…lots of energy…and praying I don’t get sick in the middle of being so worn out. My other prayers are for the loved ones in my life. My aunt is still undergoing chemotherapy, so many thoughts with her…And my friends, The Brewers, welcomed a new baby girl (Bryn) who had a major heart surgery just a week after she was born and still fighting through some challenges. NICU life is so intense and difficult. I feel for them so much. I will update with newer pictures once we get settled and set up at the next house! Hope all out there is well and many blessings at the fall and football season are upon us!